It’s raining! It’s raining! Isn’t it is thrilling to see clouds in the sky and wet stuff on the ground? Hopefully all this lovely rain will make its way to our farmers and give their fields a much-needed soak. Speaking of thrills, how about the prickly pears and sweet potato greens in our Local Box this week? I’ve never cooked either of those items before, so I am very excited to give them a try. I hear that prickly pears are similar in flavor and texture to watermelon, except less sweet, so I bet they’ll pair really well with the limes coming in the box. Sweet potato greens are similar to spinach, chard and collard greens, so I imagine they will taste great sauteed, steamed or boiled. I haven’t found many recipes where they are used raw, but those that do call for them describe them as similar to purslane in flavor. Meal one: Pan-seared tilapia with fruit salsa. I love this recipe, since it is an easy way to prepare environmentally friendly fish. I’m going to use our prickly pears and a mango, diced, in place of the tomato in the salsa recipe. Meal three: Pear stuffed pork loin, with sautéed summer squash and red pepper on the side. This pork loin recipe is definitely a weekend endeavor, since it takes half an hour of hands-on time to prepare and a few hours to bake. However, it looks delicious and it uses a jalapeño to boot. It’s also a nice change from eating pears raw, which we’ve done for a few weeks now. Meal four: Pear bread. Sautéed sweet potato leaves, cucumber and black eyed-pea salad. Try a nibble of the sweet potato leaves before making dinner; if your family will eat them raw, skip sautéing them and toss them in with the cucumber salad. Our family, my son especially, adores watermelon. The trouble is, when you get melons as giant as we’ve been getting in our Local Box, it becomes a challenge to eat it all before the sweet fruit turns bad. Watermelon jelly is a simple way to use up a bit of your stash and keep the ultimate reminder of summer available all winter long. Plus, homemade jellies make great holiday gifts. Canning often sounds intimidating but it’s quite easy, especially if you follow the directions provided in your package of pectin. The task is made easier if you have specialized canning tools on hand, but you can easily improvise with a large stock pot, a funnel, and a pair of sturdy rubber-coated tongs. You don’t need much whole watermelon to get the juice needed for this, so start out in small batches. If you make too much juice, use it to make agua frescas or margaritas! The sugar used in the recipe might look like a lot, but until you get the basics of canning under your belt, it’s not recommended to make changes to ingredients – you want to make sure you have a safe product! *To get the watermelon juice, cut watermelon flesh into chunks and puree in a blender. Strain into a cheesecloth set up over a bowl, or use a jelly bag and stand. Let sit for about 2 hours to let the juice drip down. 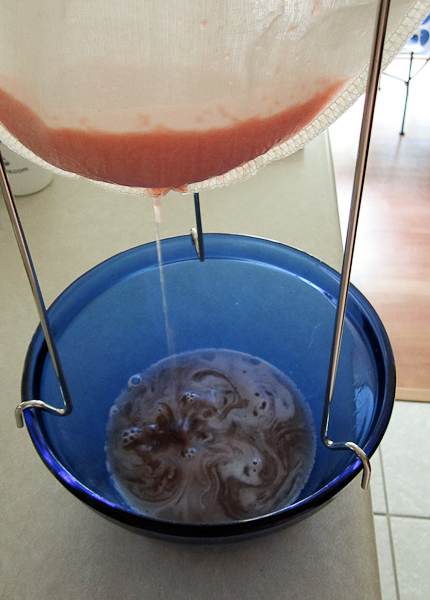 Don’t squeeze the cheesecloth or bag, or you might end up with some solids that will look ugly in your finished jelly. Pour juice into a large nonreactive stockpot or dutch oven and stir in full amount of sugar. Heat to a rolling boil, stirring constantly. Stir in pectin and return mixture to a rolling boil and cook for 1 minute. If you have a candy thermometer, cook until jelly reaches 220 degrees. Ladle into jars, place lids, and screw on bands finger-tight. If processing, place in a water bath canner heated to boiling and process for 15 minutes. Remove jars and let cool on counter for 24 hours. If not all the jars have “pinged” (when sealed properly the lids will have suctioned down) re-process or store in refrigerator. 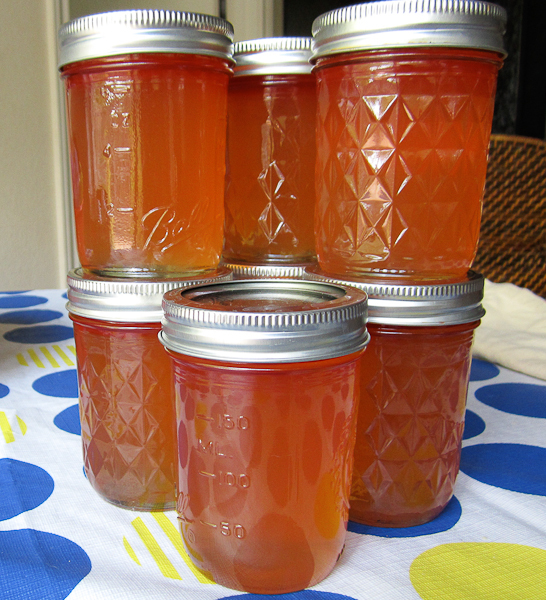 Note that jelly often can take two weeks to completely set. If your jelly still isn’t set after that, follow the directions included in your pectin box for re-cooking and processing. Sometimes when I get my Local Box I have to scratch my head and really think about what to cook with the contents, but this week posed no challenge. As soon as I saw those long beans I knew they would be perfect for a stir fry. I had never had long beans before, but they are just a mutant cousin of the green beans most of us are used to, and can be prepared the same way. Not into stir fry? Try steaming these beans whole, arranging them like nests, and placing a piece of marinated chicken or fish in the middle. Simple and delicious! This stir fry is a little bit sweet with a heat that follows. Because it isn’t a sticky, heavy sauce that douses many takeout boxes, the flavor of the vegetables still comes through. 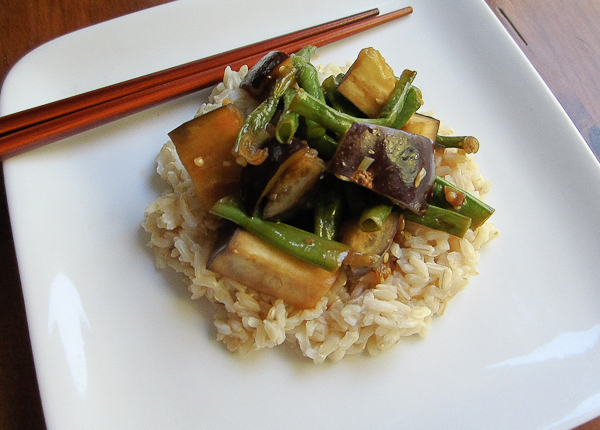 Meanwhile, dice eggplant into small chunks and slice long beans into approximately 1-inch lengths. Finely mince the shallots, garlic, and ginger, and put into a small bowl. Add the soy sauce, honey, sriracha, stock, lime juice, and remaining sesame oil to the bowl, and whisk to combine. Heat a wok or large frying pan over medium-high heat. Once heated, reduce to medium and add 1 tablespoon of sesame oil. Add eggplant and beans and cook, stirring often, until vegetables start to soften. Add sauce and stir to coat. Let cook another 3-5 minutes or so, until the eggplant looks a bit glazed and the sauce has reduced. I took my dog for a walk this morning and it felt like autumn for the first time all year. There was a breeze, the temperature was below 70 degrees, and we saw pumpkins on display at the supermarket near our house. Never mind that it was 5:15 in the morning– I’ll take all the cool weather I can get! Meal one: I’ve been waiting to get lettuce and pears together for weeks now, because of I have been craving this wonderful Roquefort Pear Salad. Don’t skip the caramelized pecans in the recipe; they’ll be perfect with Engel Farms’ crisp Asian pears. Meal two: Slow cooker field pea stew. Three or four of the multiplying onions in the Local Box will substitute for the large yellow onion that this recipe calls for. Meal three: Corn, Radish and Avocado Tostadas. Instead of the shallots that this recipe calls for, I’ll use the multiplying onions from Lund Produce. We’ll have pinto beans on the side, seasoned with garlic, chili powder and cumin. Meal four: Grilled chicken breasts, sauteed green beans with mushrooms, sliced pears for dessert. Meal five: Penne with summer squash and corn OR Penne with butternut squash and goat cheese. That summer squash recipe looks like it would be fine without the corn, so I’ll probably skip that unless we get several ears in the Local Box and I have extra to use up. One of our favorite dinners to start off the week is pasta, because it often yields leftovers to take for lunch the rest of the week. Using fresh pesto for the sauce makes it deliciously simple too! Pine nuts can be expensive, so you can try substituting toasted walnuts or almonds and it will still be tasty. This recipe from Real Simple can be prepared and on the table in under 30 minutes, plus we can utilize the hearty local summer squash from the Local Box. Enjoy and let us know what you think if you try it! Meanwhile, place the garlic, pine nuts, basil, 1/2 teaspoon salt, and 1/4 teaspoon pepper in the bowl of a food processor and pulse to combine. While the machine is running, drizzle in 2/3 cup of the oil through the feed tube, stopping occasionally to scrape down the sides. Transfer to a bowl and stir in the Parmesan. Heat the remaining 1 tablespoon olive oil in a skillet over medium heat. Add the zucchini, 1/2 teaspoon kosher salt, and 1/8 teaspoon black pepper. Cook, stirring occasionally, until tender, 4 to 5 minutes. Stir in the mint. Here’s another great customer submitted recipe for a refreshing late summer soup. We love to share culinary inspiration, keep them coming! Had to pass on this recipe that I tried out last week when my girlfriends came over. We wanted to do a light dinner of cool salads and a summer soup .. so I decided to try my hand at a cool cucumber dill soup. It was super EASY and very cool and refreshing. At the – W Ranch (pronounced Bar W) in Mullin, Texas, Jeff Wylie is putting in his fourth summer of growing fruits and vegetables. He’s tending several acres of summer squash, black-eyed peas, and cucumbers, and is preparing ground for winter squash, pumpkins, and more. Rows of fruit trees run along the perimeter, and a line of trees marks the creek — the force responsible for creating the deep, rich soil he’s farming. “It’s like chocolate cake for like six feet down,” Wylie said as he drove along the creek. His dogs came running up after the truck, Bell, the beagle, a little late and a little wet, having stopped for a dip in the lake his grandfather built years ago. Jeff’s grandfather, Ed Wylie, bought the ranch in the 1960’s and had the foresight to build in a gravity-fed irrigation system that guides the nutrient-rich bottom waters of the lake through to the lowlands by the creek, and Jeff operates a strict, drip-system irrigation to his thirsty plants. Jeff’s father, Don Wylie, insisted that he fence off the area if he was serious about a vegetable farm, since anybody familiar with west Texas knows that the deer are the real proprietors (and since the rest of the 600-acre ranch is dedicated to cattle). Jeff spent a lot of time building tall fences, but it worked, and he says now he hopes his days as a fencer are over. Clearly the effort paid off. Over six acres are fenced in and half of those are planted with vegetables in that chocolate-cake-soil. Jeff and a few employees have created a sustainable vegetable farm in the midst of cattle country. “None of this was down here four years ago when I started,” he says. Peach, pluot, apricot, and other fruit trees are reaching maturity in the field alongside row upon row of precious vegetables. In the fall, Jeff expects to harvest carrots, beets, radishes, and turnips, among other crops. We can’t wait to try them!